Total Capacity: 25.93 cu. ft.
Refrigerator Capacity: 16.48 cu. ft.
Freezer Capacity: 9.45 cu. ft. Freezes food faster to lock in freshness. Makes ice up to 50% faster. The freezer defrosts itself so you don't have to. 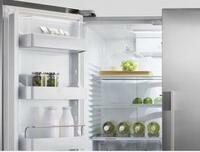 Signature electrolux style: soft-arc door, stainless steel and blue led displays. Chilled air is vented directly into this luxury-glide® drawer to keep the contents extra cold. Dual-humidity controlled crisper drawers keep fruits & vegetables fresher and extend effortlessly. It's divider and dual controls provide the option to simulatenously store fruits and vegatables at their ideal humidity levels. Smoothly glide out and keep produce fresh with adjustable humidity control and minimal temperature variation. For those who like to have their options always visible on their refrigerator, the iq-touchtm control panel displays all of your options, at all times. Our tall water and ice dispenser is specially designed to accommodate a variety of large containers, from a 16-ounce tumbler to a pitcher or a coffee carafe. Ensures fresh, clean water and ice at your fingertips. Lockable display shows vital functions, including temperature. Choose from fahrenheit or celsius display. Allow you to adjust the refrigerator and freezer temperatures independently. Refrigerator Capacity : 16.48 cu. ft.
Freezer Capacity : 9.45 cu. ft.
Total Capacity : 25.93 cu. ft. Depth without Door and Handles : 28 1/2"
Depth without Handles : 33"
Depth with Door at 90° : 49 7/8"
Height without Hinges : 68 3/16"
The ramp up designer LED lighting is as beautiful as it is functional. Slide out or removable for easy access and are designed to keep spills contained, making them easy to clean. Our control panel is thoughtfully located at the top of the door, leaving you with a clean look that fits any style. Depth without Door and Handles: 28.5"
Depth with door at 90: 49.875"